Who better to buy an F1 cast from than the Brits? If it weren’t for those pesky Italians in Maranello, it would basically be their sport. 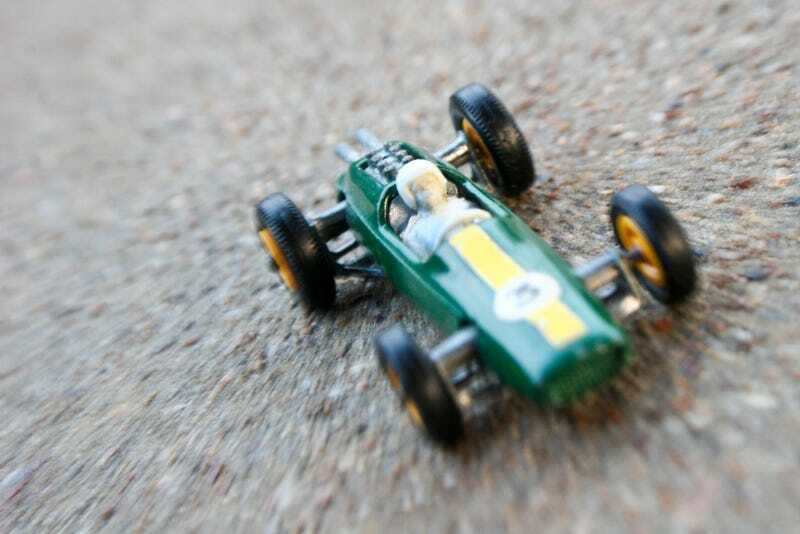 This Matchbox Lotus Racing Car (also known as Model 19D) comes from the glorious Lesney era, when the Matchbox brand was based out of the Hackney Wick neighborhood in East London. The cast is based on the Colin Chapman-designed Lotus 25 — a 1963 World Championships winner in the hands of Jim Clark. The Lotus 25 was designed and built just 10 miles or so from Lesney’s HQ, at Lotus’ original factory in the Hornsey neighborhood in North London. Lotus actually moved to Hethel RAF airfield in Norfolk about the same time this cast started being produced around 1965-66. Matchbox Model 19D was produced for several years in the late 1960s and I don’t know when exactly this example was produced. Regardless, it’s held up quite well for a 50-year-old toy — better than the three 1969-production Hot Wheels cars I have anyway.